High-rise condos are taking shape around Kierland Commons, continuing a trend of real estate following retail that’s transforming the Valley. But which living environment will own the vibrant shopping, dining and entertainment hub? The cranes have been looming over Kierland Commons for almost a year now, as construction crews have been adding floor after floor to the first two of four residential towers at Optima Kierland, a high-rise luxury condominium and apart­ment complex going up on the northwest corner of Scottsdale Road and Kierland Boulevard. Pre-leasing kicked off in February and residents are projected to start moving in around May. Just a block north of the Optima project, construction is set to begin soon on other condo buildings. Optima Kierland is the first development to follow this trend in North Scottsdale. Mike Rousculp, chief of staff/ director assistant at the American Express Desert Ridge Campus across from the Mayo Clinic, agrees the location was what sold him on moving from his current home near 12th Street and Missouri to Optima Kierland. Rousculp, in his mid-40s, is a Gen-Xer stuck between the two demographics, Millennials and Boomers, that are driving the shift to develop residential spaces in places where people can walk or bike to work or play – the so-called “live-work-play” concept. But the Kier land area is also drawing an even older demographic: folks in their 70s and beyond who are choosing to live in active urban hubs rather than the traditional retirement developments. Mary and John Cooper, both in their late 70s, are set to move into Optima Kierland as a way of downsizing from the 7,000-square-foot home they currently own in Silverleaf, the luxury home community nestled in the canyons of the McDowell Mountain Preserve in North Scottsdale. They’re not retiring – the Coopers already passed that phase when they moved to Phoenix 20 years ago, originally settling in Desert Mountain, the private gated community centered around six Jack Nicklaus signature golf courses in the high Sonoran Desert northeast of Carefree. But all that peace and quiet quickly grew too sedate for Mary. “That’s in the middle of nowhere, as far as I’m concerned,” she says. Finally the couple heard about Optima Kierland, and decided to buy up several units and combine them into one large pent­house near the top of the tower. Combining units is one of the unique options Optima Kierland offers. Hovey is the first to admit Optima Kierland is not a true live-work-play arrangement. Unlike the Plaza Lofts at Kierland Commons, which are located directly above some of the retail outlets overlooking the mall’s central plaza and in an adjacent nine-story tower, “all we have is condominiums and apartments,” he says. But it’s close enough to the action that residents will feel that “high connectivity” with the restaurants, bars, shops and office complexes nearby. Residents will also be privy to a wide range of amenities on each tower’s first floor and rooftop. For the Coopers, the Optima location, which overlooks both Kierland Commons and the Scottsdale Quarter shopping districts as well as the Westin Kierland golf course, puts all the amenities of your average 55+ community within easy walking distance, even if none of those restaurants and leisure activities are techni­cally on the property’s grounds. The Coopers are a prime example of a new type of retirees attracted to the Kierland area: older adults who, instead of relocating to age-restricted master planned communities, are flocking to high-density urban areas naturally surrounded by plenty of amenities and activities, along with a multi-generational mix of neighbors for human contact. Ironically, the generation is seeking the same type of live-work-play environment trending with Millennials and young professionals. 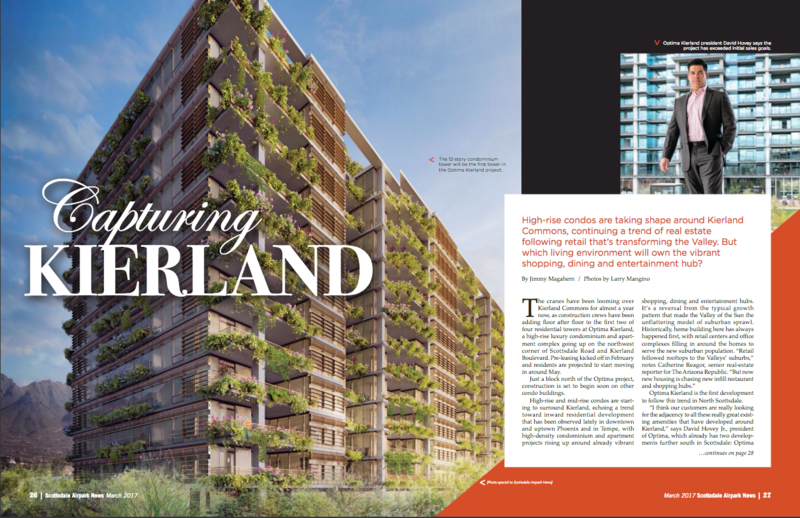 Besides, the Coopers, who lived for a time in New York City in the kinds of condo towers that have nattily-dressed doormen who greet residents courteously at the entrance every day, expects the Optima Kierland will neatly work in tandem with the surrounding businesses.